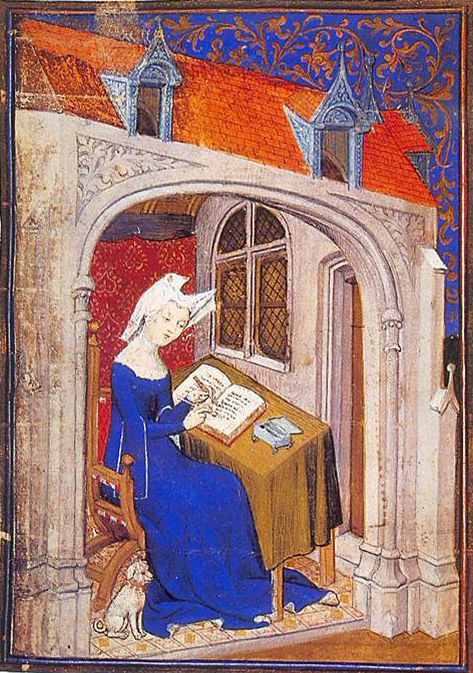 The Lais of Marie de France, translated with an introduction by Glyn S. Burgess and Keith Busby. Second edition with two further lais in the original Old French. London: Penguin Books, 1999. 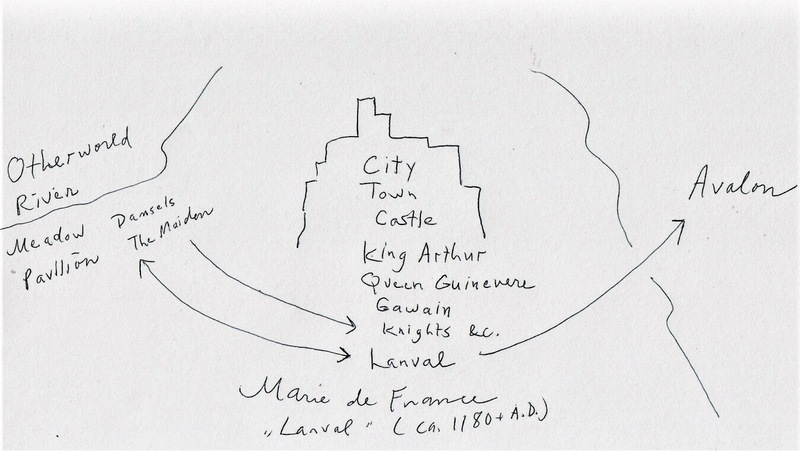 Marie de France (circa 1150-1215), "Lanval," pages -81. "Lanval" is an otherworldly tale that reverses the usual details of encountering something strange away from home. 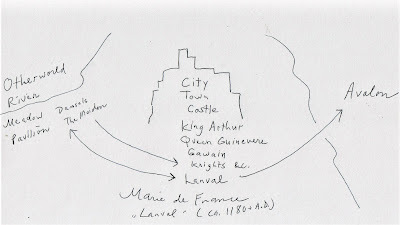 All power to save Lanval the Knight resides with "the Maiden," opposed to Guinevere, Arthur's Queen. Attended by two richly attired damsels, "the maiden" arrives from a faraway land (The Otherworld) to win over Lanval, a knight in the service of Arthur who has been somewhat neglected by the latter. Lanval is the son of a king from another land, but as soon as the maiden invites him into her pavilion -- in the woods between a meadow (where Lanval leaves his horse to graze) and a river -- he declares fealty to her above all else. "Inside this tent was the maiden who surpassed in beauty the lily and the new rose when it appears in summer. She lay on a beautiful bed . . . clad only in her shift. 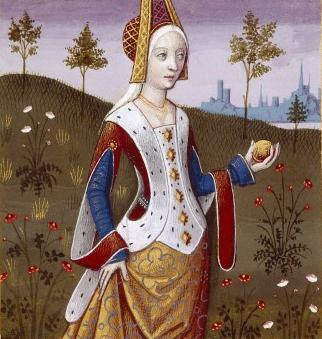 . . she had cast about her a costly mantle of white ermine covered with Alexandrian purple. Her side, though, was uncovered, as well as her face, neck and breast; she was whiter than the hawthorn blossom." (Ibid., page 74). "Within this pavilion Launfal came upon the Maiden. Whiter she was than any altar lily, and more sweetly flushed than the new born rose in time of summer heat. She lay upon a bed with napery and coverlet of richer worth than could be furnished by a castle's spoil. Very fresh and slender showed the lady in her vesture of spotless linen. About her person she had drawn a mantle of ermine, edged with purple dye from the vats of Alexandria. By reason of the heat her raiment was unfastened for a little, and her throat and the rondure of her bosom showed whiter and more untouched than hawthorn in May. The knight came before the bed, and stood gazing on so sweet a sight. . ."
But not all will be fun and games for Lanval, for the Maiden tells him that he must never speak of her in front of the other people of the City/Town/Castle. Just that one little thing -- which, of course, proves to be much easier said than not done. And even though this tale is from more than 800 years ago, no more spoilers here!